Bernard Lacoste, (June 21, 1931 – March 21, 2006) turned the family sportswear and polo shirt business founded by his father, the tennis player René Lacoste, into a major designer clothing brand. After succeeding his father as president of Lacoste in 1963, Bernard Lacoste presided over the international expansion of the group and added women’s wear and accessories to the range. In the 1970s, under Bernard’s leadership, the Lacoste polo shirt became the mainstay of the Ivy League “preppy” wardrobe and by the 1980s Lacoste had a $400 million turnover in America alone. 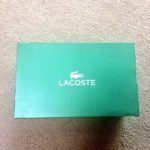 Though sales subsequently suffered a downturn, Lacoste experienced a resurgence after the recruitment in 2000 of the designer Christophe Lemaire and the development of a new stretch piqué polo shirt for women. Bernard Lacoste remained president of the company until September 2005, when, owing to ill health, he handed over the reins to his younger brother, Michel, although he remained honorary president.